Dr. Seuss' birthday was on the 2nd, but we couldn't let it go by without at least one post helping to celebrate. This past week, not only did the nation see the release of the new movie "The Lorax", but we tried out some Seventh Generation training pants -- which are now adorned with the adorable Lorax himself. As always, the diapers and pants contain no chlorine, fragrance, petroleum-based lotions or latex, and all Free & Clear products are also hypo-allergenic. Seventh Generation has also released a line of overnight diapers, designed to prevent leaks for those long hours of sleeping or traveling in a car! Learn more about Seventh Generation diapers and training pants, at their official website, or check them out on Facebook or Twitter! Wanna Win? We are giving one lucky reader a pack of a Seventh Generation Free & Clear diaper product and a copy of Dr. Seuss’s The Lorax storybook. To be entered to win, just tell us if you use or have used Seventh Generation products before. You have until March 12th at 11:59 pm CST to get your entries in, and winners will be randomly selected from all eligible entries. You may enter every day and we will pick one winner at random from all eligible entries. (Please answer the question for the first entry. Each entry after that can be "enter me.") This giveaway is open to U.S. residents ages 18+. See our full rules here. *The prize pack, information, and giveaway have been provided by Seventh Generation through MyBlogSpark. We use their overnight diapers. I have used them before and I love them! Yes, we've used them before. We love Seventh Generation products! Thanks for the giveaway! I have used their wipes before, love them! I use Seventh Generation cleaning products every day. I did purchase a pack of their diapers before. They worked just as well as normal diapers. I wouldn't have known the difference if they hadn't been a slightly different color. I've never tried the diapers, but have used Seventh Generation laundry and dish soap. I have used Seventh Generation diapers and thought they were great. My son never leaked!! I use their cleaning products. I have used the diapers and wipes and the Free&Clear detergent. I have used Seventh Generation wipes, love them!! I have purchased Seventh Generation diapers, but have not used them yet. Thank you for this opportunity to try though! i have used a lot of their products, love them! I have never used em..but would love to try them. I've used their dishsoap before. I'm trying to remember if we tried seventh generation diapers - I don't think we did. I haven't used their products. Haven't used them yet but look forward to doing so once our little man arrives. We are expecting first grandbaby in Oct....have never used, but definitely will try! I have used them and love them!! I would love to win a bag. I have not used them yet, but I would like to try them out! 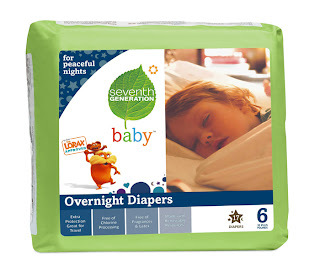 I have used Seventh Generation products before although never their diapers. I haven't used Seventh Generation Products yet! I have not used any Seventh Generation products yet but I would love to try some. kristiedonelson(at)gmail(dot)com Thank you. I have not used them yet, but I would like to try them out! Thank you for the awesome giveaway! I haven't used Seventh Generation before, but I would love to try them out! I use seventh generation cleaning products and love them! I would love to try the diapers! I use their dish soap! I have never used Seventh Generation products before. I would love to try. My daughter Katie is finally expecting after many long years of waiting. I would love to win this for her and my 1st grand baby!!!! Love Seventh Generation. I used them for laundry & cleaning and baby wipes. sometimes I use the diapers. And we love Dr. Suess! Yes, I use the multi-purpose cleaner. i'/ve used their detergents before. The other day I made my first purchase of this brand... some disinfectant. I was sick of breathing in all the chemicals of the other stuff. I have used their wipes! I have not used their products before. I have never used any Seventh Generation products. But I have started to notice them on my local stores shelves. My d.i.l had the wipes the last time I was at their home. No, I've never used them before, but I've been REALLY wanting to try them! I Haven't used Seventh Generation products yet, have been wanting to!